What will it be like to see God? It will be awesome! We will see his purity in all its splendor and glory. One of God’s greatest attributes is his purity. He is perfection, without blemish. His integrity is utterly pure. Spotless. We see God’s purity in the sinless life of Jesus, who, though tempted in all things, always yielded to the will of his Father. When we see God face-to-face, we will see him as he is. And we will be fully transformed into his image. We should be pure just as Jesus is pure. 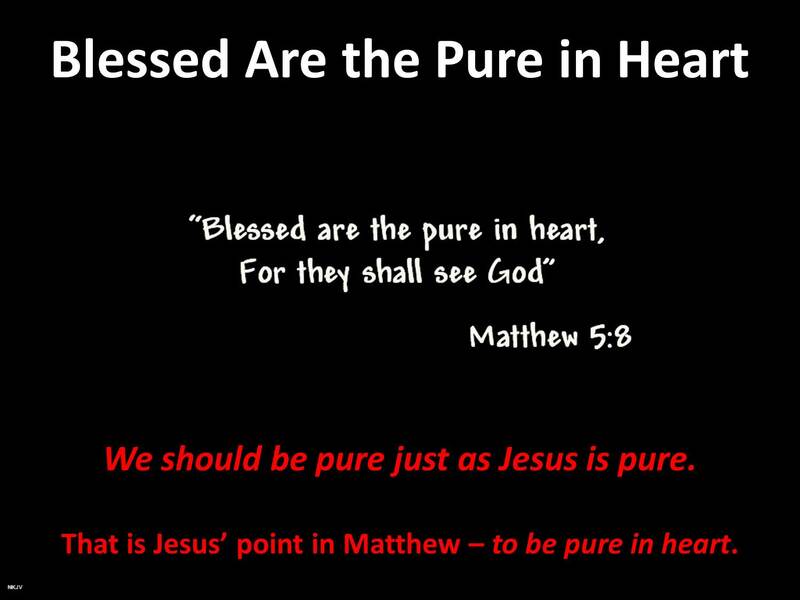 That is Jesus’ point in Matthew – to be pure in heart. This is why Paul exhorts us to replace the old man with the new. We should eliminate those things in our lives that do not belong there. Every time we seek and do God’s will instead of our own, we are being purified. If we grow in the grace and knowledge of Jesus Christ today, we will fully experience the purity of Jesus in heaven. We, the Bride, are being purified for our marriage to Jesus, the Lamb of God. Let us eagerly embrace our purification just as a bride prepares for her wedding day. This entry was posted in Uncategorized and tagged Beatitudes, bride of Christ, glory, integrity, pure in heart, purification, purity on May 30, 2015 by BrotherWatch. Noah Galloway, a double-amputee Iraq War combat veteran, challenges himself running marathons, motivating others, and, now, dancing for Dancing with the Stars. His resiliency and determination are an inspiration for those who witness his character, his courage, and his compassion. With humor and humility, Noah has won the hearts of many across the country. Noah’s story and his example model for each of us how to examine ourselves, change the image that we see in the mirror, and pursue our passions. Noah kept his pain and suffering hidden, even form himself. Week Three saw Noah reject a new prosthetic arm (learning to dance and learning to use the arm at the same time was too much), finding that he could perform beautifully without it. Week Four was transformational and inspirational. Noah revealed a turning point in his life and his contemporary dance brought his story to life. Noah’s dance began with special effects showing a shirtless Noah with four limbs, then the reality was revealed in a mirror, a man seemingly less than whole. But then – the dance! It was as if Noah had experienced a new birth. During Week Five, Sharna Burgess reminded Noah, “What is it that we said in the beginning? We’re not gonna focus on what we can’t do, but what we can!” Something we should all remember. Let’s begin Week Nine with the highlight of the night. Following Noah’s first dance of the night, Jamie Boyd told Noah, “You’re just a beautiful dancer and you just have a beautiful heart and you put it out there every single week.” Then, making DWTS history, Noah stunned his girlfriend and the audience by getting down on one knee and proposing to Jamie, who immediately accepted. Wholeness and completeness are themes returned to again and again during this DWTS season. 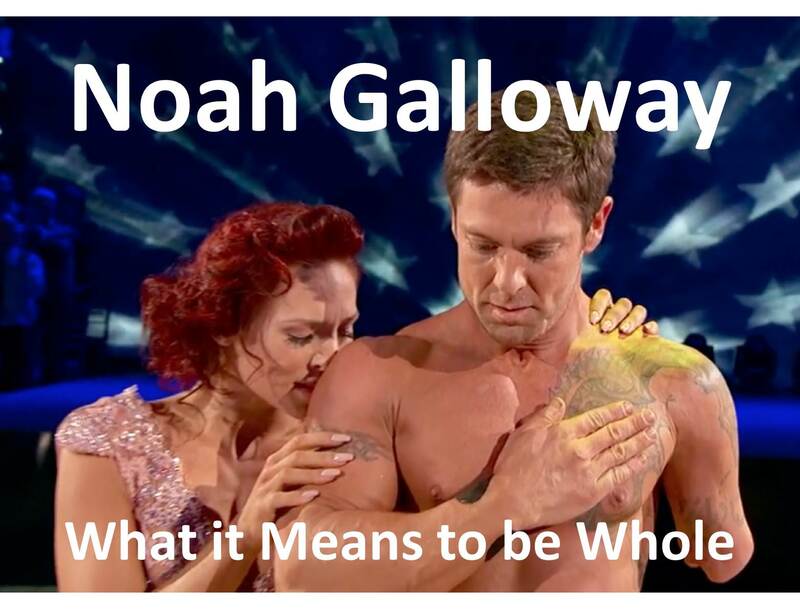 Anyone who questioned Noah’s wholeness or his manhood prior to DWTS has surely been awakened ti reality, for, in reality, as human beings we are all too often prone to falling for outward illusions while missing the inner reality. Some might think that due to what he lacks, Noah might be less than human. But, instead of less, he is more. Digging down deep and – whether or not he knows it – by the grace of God, Noah has achieved what few could imagine. And Noah has done so with integrity. This column is being posted prior to the results of the finals. 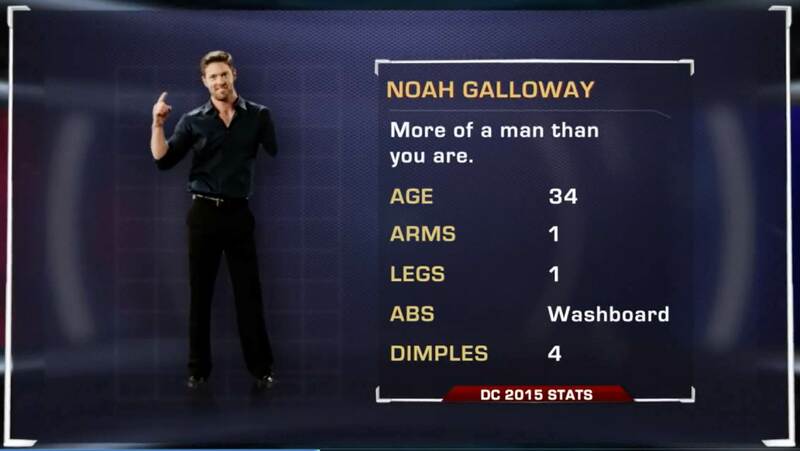 Regardless of the outcome of this particular competition, Noah Galloway is a winner in life. He has proven himself a champion – to himself and to the world. Noah has nothing else to prove. Noah’s story is one of not just survival but victory. He proves that, given a chance – or taking a chance – the human spirit can rise above seemingly impossible challenges and not only survive, but thrive. Don’t be defined by others. Don’t let other people place limitations on who you are or what you can accomplish. Adapt. Life happens. Whatever happens, we can adapt to our changing circumstances in order to survive and thrive. Aim high. Don’t settle for less or limit yourself. Rather, challenge yourself. You just might surprise yourself. Have a sense of purpose. Noah changed his life for his children. He had someone to be better for – his family and, now, his fiancé. Noah is now a “personal trainer and motivational speaker” whose motto – “No Excuses” – graces the name of a charitable foundation. This entry was posted in Uncategorized and tagged character, compassion, courage, Dancing with the Stars, DWTS, humility, humor, integrity, Noah Galloway, victory on May 19, 2015 by BrotherWatch. If you are in Christ, God has already blessed you and is blessing you. 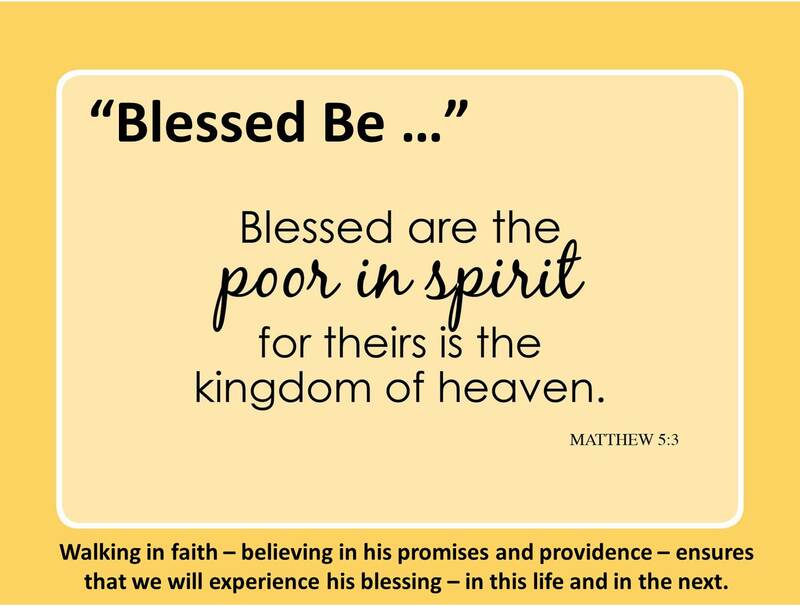 Do you believe that you are blessed? Often, we can miss out on God’s blessing due to a lack of faith. Those who yield their lives to God and become dependent upon him are blessed by God. Walking in faith requires humility. Your humility and your dependency upon your Creator and Redeemer opens the treasure-trove of God’s blessings in your life. Remember, Jesus came to give us an abundant life (John 10:10). You are blessed when you believe you are blessed. Believe it and live your life in that reality, and you will experience the hand of God in your life. Being his children, our Father lavishes his love on us. It is his desire to give us the kingdom (Luke 12:32) – treasures in heaven and on earth. Our Father wants us to live our lives in the blessings he provides every day of our lives. Experiencing the blessing. Walking in faith – believing in his promises and providence – ensures that we will experience his blessing – in this life and in the next. If you believe God and trust in his providence as you walk with him, you can be assured of an abundance of blessing in your life. This entry was posted in Uncategorized and tagged blessing, God, Jesus Christ, poor in spirit, Providence, walking in faith on May 16, 2015 by BrotherWatch. I am asking you to stop and think for a moment about all of the rights that we are guaranteed as Americans. We are guaranteed these freedoms thanks to the brave men and women who have served in our Armed Forces from the Revolutionary War to the current war in Afghanistan – especially those who have given their lives in the cause of our country. On Memorial Day, we pause to honor and to celebrate those who made the ultimate sacrifice defending our freedoms. The American Veterans Center’s National Memorial Day Parade is the largest parade dedicated to honoring these heroes. This year, the American Veterans Center is commemorating the 70th Anniversary of the end of WWII, from which more than 400,000 Americans never made it home. This may be one of the last times many of these veterans will be around to hear the cheers from the crowd, cheers thanking them for their service and sacrifice. I want to make sure that they are properly thanked ONE LAST TIME! I only wish my father, a proud WWII veteran, were alive to participate in this wonderful event and hear the crowd roar as he rode down Constitution Avenue. I am writing to you today because we need your help to make this year’s celebration the most successful parade thus far. WWII veterans will travel from all over the country to ride on floats down Constitution Ave, but we need your early support to help ensure that we can get them to Washington. Will you make a tax-deductible donation of $10, $25, $50, or more to help us honor our troops in the National Memorial Day Parade? A $25 contribution will help cover the cost for a WWII veteran to ride on a float or car in the parade. If you give $500 or more The American Veterans Center will send you the iconic photo of the kissing sailor SIGNED by the sailor and the nurse. Since the National Memorial Day Parade is primarily supported by volunteer efforts and is 100 percent privately funded, your tax-deductible donation to the American Veterans Center can make all the difference. Let me put this parade into perspective, for the same cost of ONE float in the Rose Bowl Parade or TWO balloons in the Macy’s Thanksgiving Day Parade, the American Veterans Center puts on its ENTIRE parade. That’s why your gift of $25, $50, $100 or more is so important to ensure a successful celebration in honor of our military. Today we are free because they have sacrificed. We are safe thanks to America’s heroes. Can I count on you to join me in honoring our WWII veterans this Memorial Day and to help the American Veterans Center host this special WWII anniversary? Click here to chip in $25, $50 or whatever you can afford to honor our brave men and women. Don’t forget, every dollar you give to the American Veterans Center is tax-deductible, so please give generously to this worthy event. Every cent of your hard-earned dollars will be greatly appreciated, not only by the American Veterans Center and me, but also by the veterans and active duty troops we will honor this Memorial Day. P.S. Your tax-deductible donation to the American Veterans Center will allow WWII veterans from across the country to ride in the National Memorial Day Parade in Washington, D.C. on May 26. Please support us with a gift of $10, $25, $50 or whatever you can today and help us thank our brave veterans and active duty troops. If you give $500 or more The American Veterans Center will send you the iconic photo of the kissing sailor SIGNED by the sailor and the nurse. After you have donated, please take a minute to sign up for the Virtual Boots on the Ground and join thousands of Americans like you in honoring our veterans and soldiers online this Memorial Day! This entry was posted in Uncategorized and tagged American heroes, American Veterans Center, Laura Ingraham, veterans on May 13, 2015 by BrotherWatch. 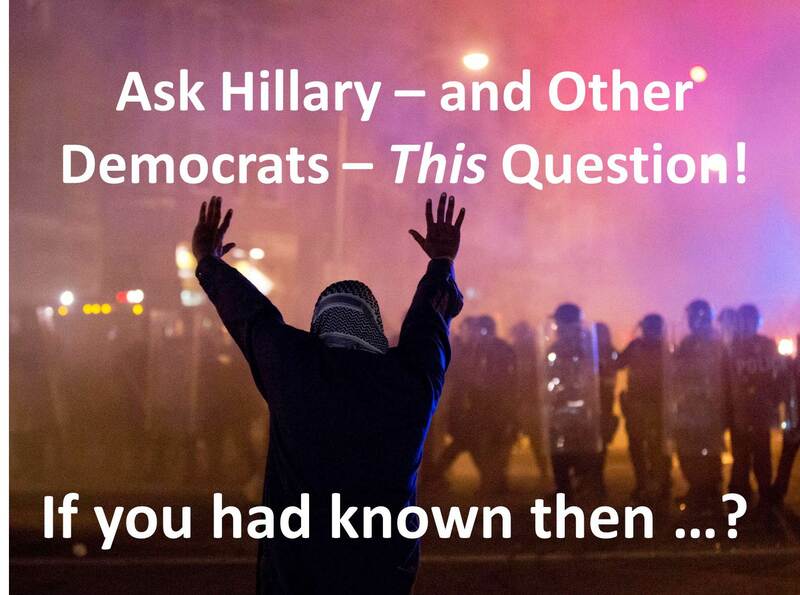 This entry was posted in Uncategorized and tagged Amtrak, big government, centralized planning, disaster, free enterprise, private sector, propaganda on May 13, 2015 by BrotherWatch. As we watch the world being engulfed by flames and our nation wracked with countless crises, it is good to remember that our God is sovereign, He reigns supreme, and nothing escapes His notice. Our Founders were men of God who trusted in His Providence, and we would be fools not to do the same. 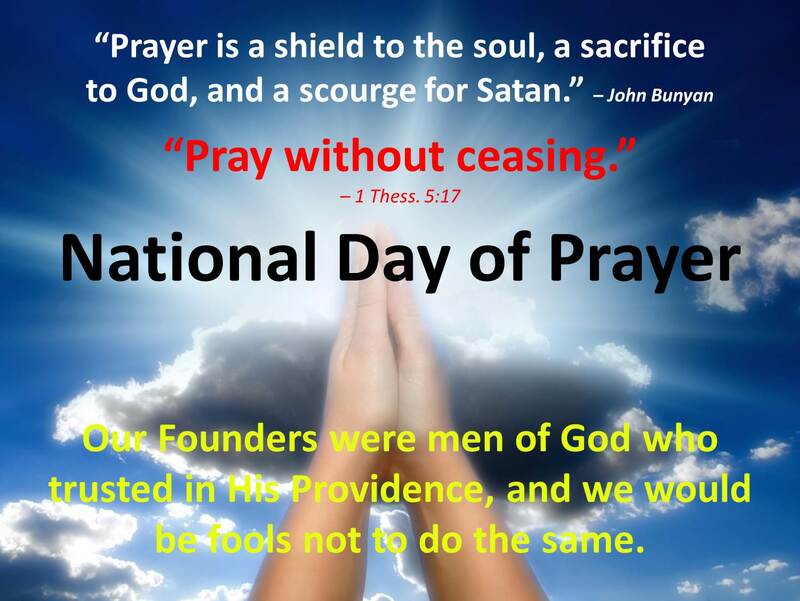 This entry was posted in Uncategorized and tagged confession, divine intervention, intercession, National Day of Prayer, prayer, Providence, reformation, renewal, repentance, restoration on May 7, 2015 by BrotherWatch.